Save the Date for the Annual Kitten Shower! – Nevada Humane Society | With Shelters located in Reno, and Carson City, the Nevada Humane Society Caring is a charitable, non-profit organization that accepts all pets, finds them homes, saves their lives, and is recognized as a leader in animal sheltering and stewardship. Save the Date for the Annual Kitten Shower! Every year, Nevada Humane Society staff knows for certain one thing is going to be true: April showers bring May meowers. This year, we expect more than years before! 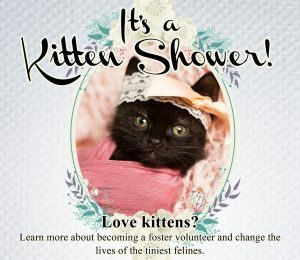 In order to prepare, it’s time for the annual Kitten Shower, being held on Saturday, April 6, at Nevada Humane Society in Reno and Carson City. The fun-filled event aims to educate people about orphaned kittens in shelters, provide gifts for kittens, and enhance the group of Foster Caregivers — the volunteers who offer temporary homes to underage kittens and puppies. The Kitten Shower is Saturday, April 6 from 10 am – 1pm at Nevada Humane Society in Reno and from 3pm to 5pm in Carson City. Nevada Humane Society foster coordinators will be present to teach people how to bottle feed neonatal kittens and socialize older kittens to make them ready for adoption. These gifts are tax-deductible and will help care for the hundreds of kittens that are expected to arrive at the shelter this season. Other gift requests are available online through Amazon Smile (a simple and automatic way for you to support your favorite charitable organization every time you shop, at no cost to you) at http://a.co/49oeddA.